For 150 years, Granges and their members have played an active role in their communities. In the 1800s and early 1900s when many Granges were first founded, while agriculture was the focus of their interests, members gathered together to make a difference in their communities with the important topics of their time, including rural mail delivery and electricity, food, fuel and textile production, and more. Today’s Granges still stand by the same mission and vision as their forefathers. Community Service has now become one of the strong cornerstones of the Grange, and each Grange is in a unique situation as it celebrates its own community. Just as no two communities are the same, no two Granges are the same. Projects can be on a large scale, such as saving a local zip code by housing the post office to a small scale, such as collecting non-perishable items for the food bank or blankets for the local animal shelter. All are equally as important and vital. Yet they all share one thing - that Grange members are proud to be working together to give back to their individual communities. So why aren’t members busting down the doors to join? One reason may be poor communications. Communication is a key component of any organization - Internal and external. Members should be encouraged to share their ideas and concerns, giving the sense that they are valued. Happy members are productive members. When members are undervalued, they tend to only offer minimum contributions, thus leading to a reluctance to further volunteer their time or ideas. Unclear responsibilities and time pressures are the most common ways members are miscommunicated with. External issues such as missing media deadlines, lack of focus, or ignoring external communications in general are also common. So you can see how poor communications can just snowball. -- Start a Grange newsletter and email / mail to all members. -- Decorate your Hall with a Bulletin Board, and keep it updated with upcoming event and meeting information. -- Choose a member of the month - and spotlight that person and their interests. Then write an article about the member and send it to the local newspaper. -- Start a Facebook page for your Grange and keep its updated. -- Be sure to send out press releases for all important meetings and events. -- Ask people who don’t often attend meetings to perform specific tasks - such as lend a hand with refreshments or help out with the literary program - or even just be the “greeter” for the evening. -- Call or text members to remind them of upcoming meetings and events. -- Take a survey of members and their interests, and then use the findings to develop future programs. Granges who make an effort to celebrate communications will find their community efforts are strengthened. Need some help strengthening your Grange communications? 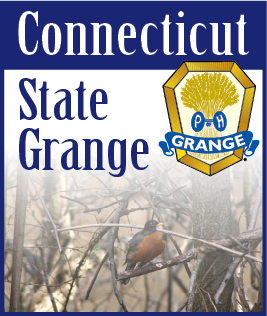 Send an email to Bob at publicrelations@ctstategrange.org or Terri at information@ctstategrange.org with your needs and questions, and we can get the process started for you.